Daily classes open from 9h00 to 13h00 every day at AVATAR Danang Hotel. 09h00: Our guide will pick you up at the hotel. The class lasts 4 hours, starting with the market trip. The guide will bring you to a local market and tell you about the main ingredients in Vietnamese cuisine, so you can have a clearer overview about Vietnamese food and an insight into Vietnamese herbs and spices (herbs and spices are important in Asian dishes). You will get to know some key useful Vietnamese words to buy and bargain the necessary ingredients yourself , which is very useful for you to bargain anything you want to buy afterward in your Vietnam trip. 10h00: After buying the necessary ingredients for the class. The guide will bring to the fresh vegetable and herb gardens where you can get a nice explanation about the herbs/veggies they grow. 10h30: You will come back and have a coffee at Joy Café in the hotel for taking a rest. 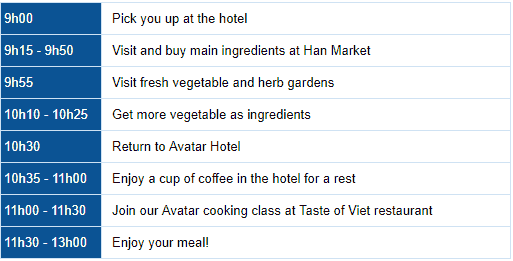 11h00: Join our Avatar cooking class at Taste of Viet restaurant (3rd floor) and listen to the dishes’ principles and general methods, then watch how the guide prepare the foods. You can really get your hands on the cooking. Enroll in this class, you are guaranteed to have unforgettable experience while in Vietnam, and confident to treat your beloved family and friends with the mesmerizing Viet dishes when you come back.